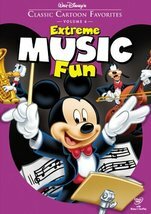 Animated favorites from the Golden Era of the world famous Walt Disney Studio are collected in CLASSIC CARTOON FAVORITES V. 6: EXTREME MUSIC FUN. This collection features eight Disney cartoons, all revolving around the theme of music, and starring beloved characters like Mickey Mouse, Donald Duck, Goofy, and others. The cartoons included are "Mickey's Grand Opera," "Music Land," "Orphan's Benefit," "Farmyard Symphony," "Pluto's Blue Note," "How to Dance," "Woodland Café," and "Donald's Dilemma."